Your car's cooling system is designed to keep the engine from overheating while in operation. This is achieved through the use of engine coolant and a radiator which removes heat from the coolant once it has passed through the engine block and cylinder heads. In time the engine coolant will need to be changed and flushed to help protect the engine gaskets, seals and cooling system from corrosion which will cause coolant leaks. Depending on usage and driving conditions such as sub zero weather the engine coolant should be changed every 55,000 miles to help keep its protection properties. 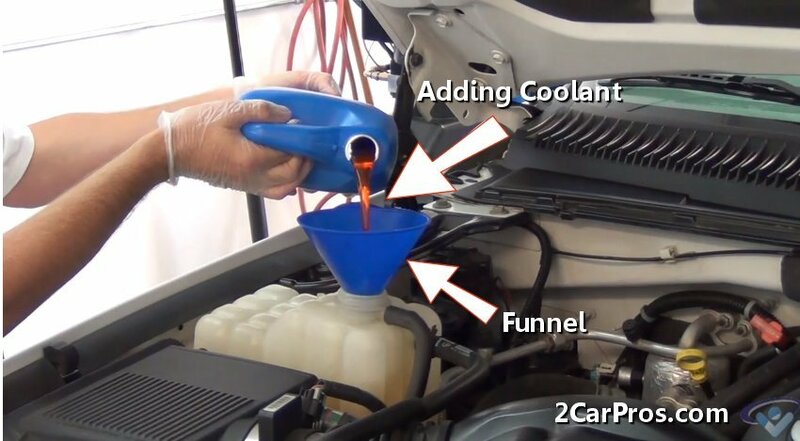 There are different kinds of coolant which can go longer between changes and many manufactures have specific coolant that must be used with their particular automobiles. If a normal service schedule has been neglected coolant can transform its chemical composition and actually turn into an acid which will erode gaskets and seals causing coolant leaks. When having a cooling system service performed by a repair garage or dealer it will cost between $120.00 and $160.00 (US). This will include emptying of the radiator and cooling system and coolant reservoir and refilling it with new coolant. They should also check the system coolant level once the engine has warmed up to it's operating temperature. You can do the job yourself for about $30.00 (US) by getting the coolant yourself from Amazon or the local parts store. 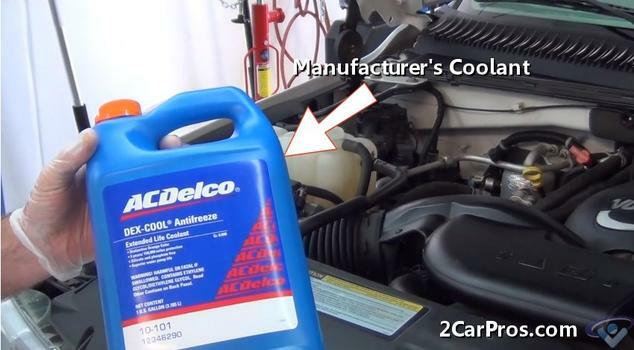 When changing the coolant from your car's radiator there are two things to remember. First, no matter how much coolant has drain out of the system there will always be some left in the engine block which will be difficult to remove just by draining the system for the first time. A flush machine can be used but the problem is most states have outlawed these machines do to their waste coolant expulsion into the environment. It is now preferred to drain the cooling system then refill it, run the engine for a short time and then drain and refill it again to flush the system. The key is to not allow any of the waste coolant out into the storm drains or the environment in any way. Also coolant is toxic and will harm animals and humans if ingested. You may need to raise your car off of the ground using a floor jack and supporting it with jack stands for safety. Start with the engine cool and wear gloves and safety goggles. 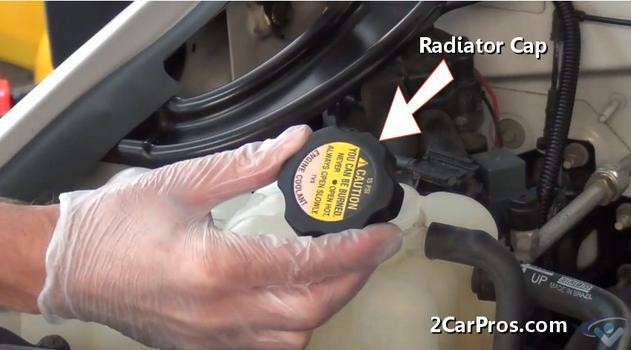 The radiator cap is located on the top of the radiator or on the coolant reservoir. Some systems have two caps one that holds pressure and the other just keeps dust and dirt out of the reservoir. Release the pressure inside the cooling system by pushing down and slowly twisting the cap counter clockwise. This will make sure there is no pressure in the system and it will allow air to enter the system while draining. 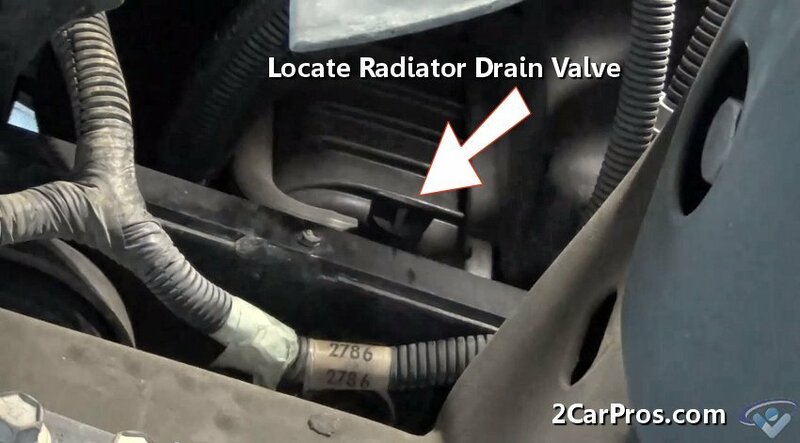 Most car's have a radiator drain valve that will be visible at the bottom tank or on either side tank. If a valve is not available loosen the lower radiator hose and slowly remove it from the radiator to initiate the draining process. Open the drain valve by turning the it counter clockwise. Have a fluid catch basin ready to catch the now draining coolant. Sometimes the coolant will contact frame members and other supports which can make catching the coolant a little more difficult. In these cases use more than one catch basin. Clean up any residual coolant that has not made it into the catch basins so it will not be stepped into during the service. 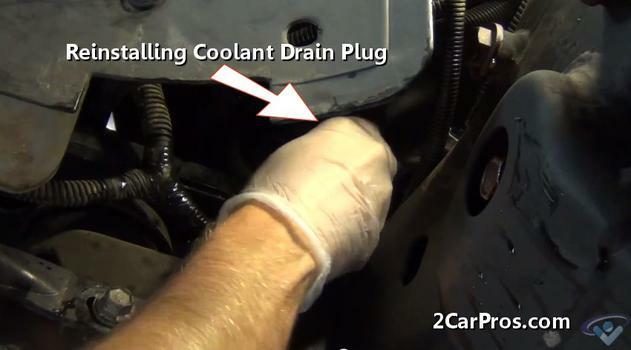 After a short time the coolant will stop flowing which means the coolant is done draining. You should have between 1 1/2 and 2 gallons in the fluid bucket or catch basin. Be sure the radiator cap has been removed which will help you get most of the coolant out if the system. 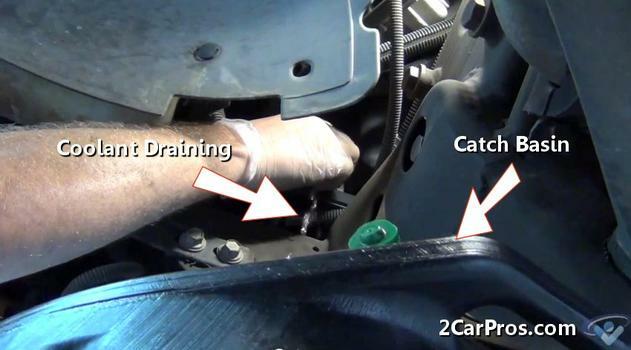 Then tighten the drain plug or reinstall the lower radiator hose. 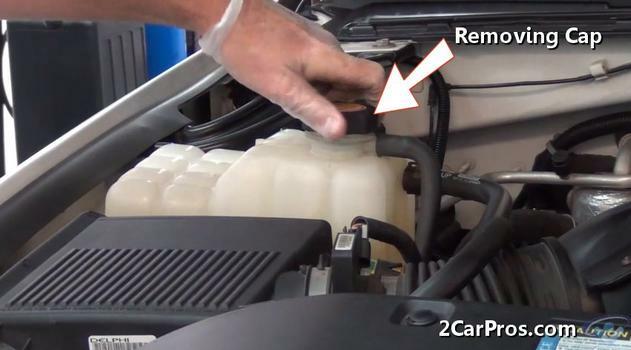 To flush the cooling system refill the radiator with plain water. Then start the engine and allow it to run until it is at operating temperature while keeping the radiator or reservoir full. Once the engine is warm and the thermostat has opened shut the engine off and repeat the draining process motioned earlier in this guide. Perform this operation as many times as needed until the system is clean. If your car has a non pressurized external coolant reservoir you are going to want to remove it and clean it out separately so any old coolant does not contaminate the new coolant in the system. 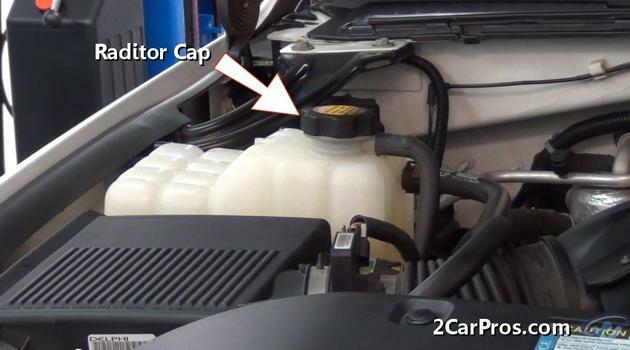 When you are ready to refill the system with coolant remove the cap from the new coolant container. Underneath the cap there will be a seal that ensures you that the coolant has not been watered down and is pure from the manufacturer. Using a funnel to avoid spillage slowly pour the coolant into the radiator or reservoir until full. Then start the engine and allow it to warm up while slowly adding coolant. 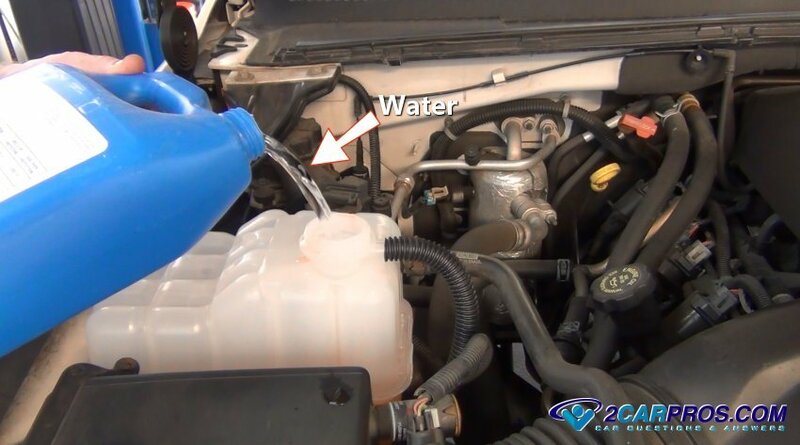 If you have flushed the system there will be no need to mix coolant with water because there will be a sufficient amount or water still remaining in the engine block. Continue to add coolant until you have reached the full line in the reservoir or the top of the radiator. Start the engine and allow it to warn up until the thermostat opens, you will notice the level in the reservoir or radiator drop. Continue filling the system until it is at the full when hot line. While the engine is still running reinstall the radiator cap. 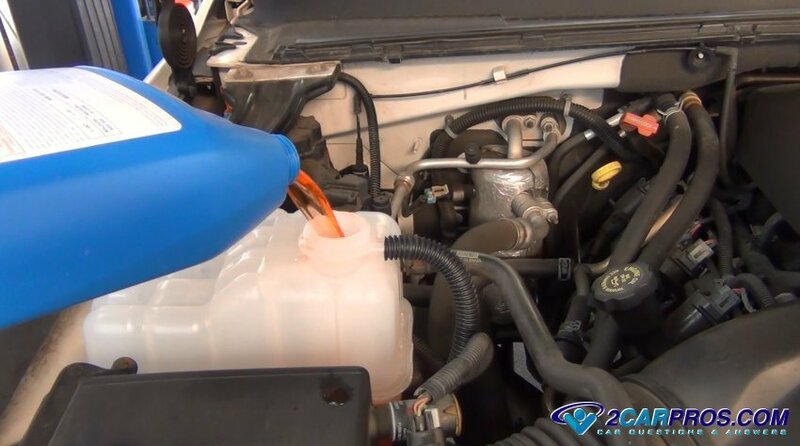 Be sure to double check the coolant level in a few days and check for leaks or that air bubbles in the system have not worked themselves out of the system lowering the coolant level. Also check the coolant level in the reservoir and refill as needed. If you have any questions about a radiator flush, please visit our forum. If you need car repair advice, please ask our community of mechanics who are happy to help. Our service is always 100% free.